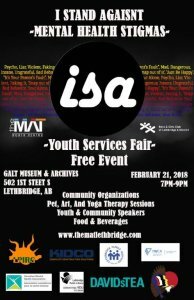 The MAT Youth Centre and Boys & Girls Club of Lethbridge are pleased to announce the launch of our 2018 ISA Youth Services Fair! I Stand Against: Mental Health Stigmas will take place on February 21st, 2018 at 7pm at the Galt Museum & Archives. ISA brings together community organizations, entertainment, and speakers for an evening of connecting youth to community resources along with raising awareness for mental health issues in our community. Stigmas and discrimination attached to mental illnesses present a serious barrier, not only to diagnosis and treatment but to acceptance in the community. Photo Hand Contest: Take the pledge that you will stand up against mental health stigmas by I writing “I Stand Against” on the back of your hand and post it to social media with #ISA2018 for your chance to win epic prizes!! The evening will be filled with activities, free food, speakers, performances and more! All to be announced in time leading up to the event. Visit: www.thematlethbridge.com for more info!